IT-oLogy is the South Carolina Affiliate for the Aspirations in Computing award. 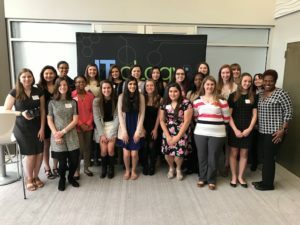 The NCWIT Award for Aspirations in Computing builds a talent pool for the growing technical workforce and helps academic and corporate organizations celebrate diversity in computing by honoring young women at the high-school level for their computing-related achievements and interests. Award recipients are selected based on their aptitude and aspirations in technology and computing; leadership ability; academic history; and plans for post-secondary education. Interested high school young women can apply, starting in September. Winners are announced in March of the following year. Questions? Contact Rachel Barnett at rachel.barnett@www.it-ology.org. Visit www.aspirations.org for more information. Questions about Aspirations? Contact Us!